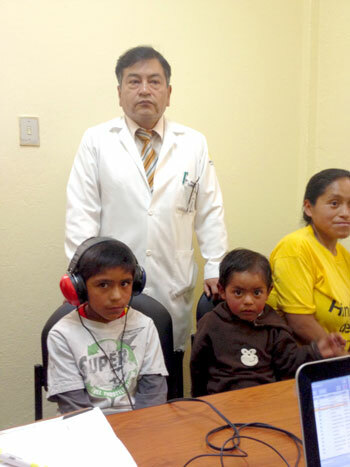 The International Initiative for Impact Evaluation (3ie) recently awarded a grant for $277,000 to USU to evaluate the school hearing screening initiative in Ecuador. The hearing screening initiative has been implemented by the Ecuadorian Vice President’s Office and the evaluation study will be done collaboratively by USU and the Vice President’s Office. The purpose of the study is to evaluate a recent national initiative to screen the hearing of all children ages six to nine years in Ecuador. The outcomes of the study will provide information for policy decisions. Utah State University faculty members in the Department of Communicative Disorders, Center for Persons with Disabilities, and the National Center for Hearing Assessment and Management will be coordinating the study to compare the current Ecuadorian questionnaire screening procedure to an audiometric screening procedure. Problem. Permanent hearing loss affects approximately 1% of young children in industrialized nations and the incidence is probably higher, but not well documented, in developing countries. When not detected early in life, children who are deaf or hard of hearing (DHH) lag behind their peers in language, social, and cognitive development, fail more frequently in school, and do not acquire the skills to be successfully employed. For 75-80% of children who are DHH, treatments are simple and relatively inexpensive. Even for children needing more expensive treatments, there is clear evidence that the benefits significantly outweigh the expenses. Proposed Solution. Recognizing the benefits of early identification of children who are DHH, the Ecuadorian Vice President’s Office (working with the Ministry of Education and the Ministry of Health) has implemented a hearing screening program for all 6-9 year old children (approximately 1 million children in any given year). The screening is done at the beginning of each year by teachers in each school using an 18-item questionnaire to evaluate each child’s ability to interact with others and respond to verbal instructions. Children who cannot do 5 or more of the behaviors in this questionnaire “fail” the hearing screening and are referred to a local health facility for audiological assessments to determine whether the child is DHH. Evaluation Questions and Design. The screening instrument is inexpensive and easy to administer, but it is unknown whether it accurately discriminates between children who are DHH and those who hear normally. The evaluation study will use a random sample of 50 children from each of 100 randomly selected schools to compare the results of the teacher-administered hearing-screening questionnaire to results of a standard validated audiometric screening. 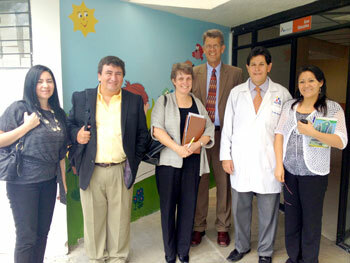 Ecuadorian health care providers will be trained to do the audiometric screening. Spanish-speaking pediatric audiologists from Utah State University who are experts in hearing screening will supervise data collection. The results of the teacher-administered questionnaire and the audiometric screening will be compared to determine the number of children who are DHH and passed, have normal hearing and failed, are DHH and failed, and have normal hearing and passed (respectively, false negatives, false positives, true positives, and true negatives). Cost analyses will be done to determine the financial impact of incorrectly identifying children who are DHH. Teacher and parent satisfaction with the program will be assessed. The percentage of children lost to follow-up between screening and audiological assessment will be measured. Since January 2012, the office of the Vice President of Ecuador has been responsible for the implementation of the Hearing Screening Program, in collaboration with the Ministry of Education and the Ministry of Health. Senior staff from all three offices has been involved in the development of the proposed evaluation activities. The teacher-administered hearing-screening instrument was developed by the Ministry of Education. The Vice President’s office, assisted by Regional Special Education officials, is responsible for nationwide implementation of the program. The Ministry of Health is responsible for diagnostic assessments of all children who fail the hearing screening administered in the schools. Ecuador is committed to helping individuals with disabilities and findings from this study can help other developing countries. The Emma Eccles Jones College of Education and Human Services at Utah State University is also committed to outreach that supports early identification and intervention for individuals with disabilities. For more information about the project, contact Dr. Karen Muñoz, Assistant Professor of Communicative Disorders and Deaf Education at USU who is the project director.